This is a classic word problem of the sort that I hope to eradicate from mathematics instruction (at least from my own). Why eradicate them? I have already presented my first argument-that they do not represent the ways anybody actually uses mathematics. At their very very best, word problems are intriguing puzzles and perhaps like a clever lyric or a piece of a melody they provide a bit of satisfaction to the aesthetic soul. 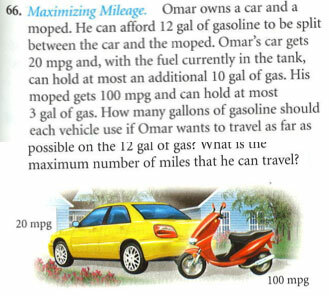 But few word problems meet this standard. Instead, they represent to many students roughly half of what mathematics is (most the other half is abstract symbolic manipulation). Students who find these problems silly come to believe that mathematics has nothing to offer them. I believe students are right in asking When am I ever going to use this? I can honestly tell students that they will not ever be in a situation where they know the sum of two addresses, and where they know that the addresses are consecutive, but where they do not know either address. Occasionally I let myself believe that American math teaching has made substantial strides since the release of the 1989 NCTM Standards for School Mathematics and the revised Principles and Standards 2000. I recently had an experience that set me straight. I was in my College’s Math Center, where the developmental math courses are housed (i.e. those courses not bearing college credit because they cover remedial topics). The apartments problem cited above comes from the textbook we use for these developmental courses. Seeing the similarities between the perspectives of our textbook and this supplementary book, I noticed the Preface. There is no area in algebra which causes students as much trouble as word problems…Emphasis [in this book] is on the mechanics of word-problem solving because it has been my experience that students having difficulty can learn basic procedures even if they are unable to reason out a problem. And here is the crux of the matter. I have already argued that the very nature of word problems is such that people’s actual experience has no bearing on solving them. But in this preface is the rarely stated truism that we can train students to work these problems even when we cannot teach them to think mathematically. Entire sections of textbooks are devoted to the translation of word problems into algebraic symbols and Ms. Johnson has written the book on it. While I appreciate Ms. Johnson’s efforts to help students through the arcane world of word problems, I am saddened by the uncritical approach. There is no discussion of why students should be forced to learn to solve artificial word problems, nor a questioning of whether there might be better uses of their (and their teachers’) time. I began to wonder how recently the book had been written, given the similar perspectives of our text with this supplement. The copyright is 1976. In thirty-four years, we have truly made no progress. Bittinger, M. & Beecher, J. (2007). Introductory and intermediate algebra: Third edition. Boston: Pearson. Johnson, M. (1976). How to solve word problems in algebra: A solved problem approach: Updated first edition. New York: MacGraw Hill. A new algorithm for finding Least Common Multiple? A student in a developmental algebra course was struggling with problems involving least common multiples. The lesson she was working on involved finding the least common multiple of numbers first, and then using that process as an analogy for finding least common multiples for variable expressions. Surprisingly, she felt confident with the variable expressions and was struggling with the numbers. She ended up with only a 2 and a 3 remaining, which is six and she knew this was not correct. Six is not even a multiple of these numbers, never mind the least common multiple. I restated our textbook’s approach, to wit: We want to use each factor the same number of times as it appears in the number in which it appears most often. There really is no simple way to state this and I worked a couple of examples for her. We cancel two of the 2’s in 24 because they match up with the two 2’s in 36. And we cancel the one 3 in 24 because it matches up with one of the 3’s in 36. We could have cancelled the two 2’s in 36 instead-that’s not important. What is important is that we cancel them only once. Karen loved this algorithm and was very, very pleased to have her thinking changed into an algorithm that works. The interaction was partly satisfying for me and partly disturbing. Karen began very frustrated and ended feeling successful and bright. That is always satisfying. But what had she really learned? She is not studying least common multiples for their interesting mathematical properties. Instead she is studying them in order to be able to add, subtract, simplify and solve rational expressions. Without questioning the larger goal of the whole enterprise of developmental college mathematics, it is still reasonable to ask how important least common multiple is for operating on rational expressions. And the same is true of the rational expressions Karen will be working with shortly. So why do we induce this stress in our students? If the only reason to find least common multiple is to work with rational expressions, and if at the same time any common multiple will do, why do put this artificial barrier in front of our students? And why do we, as teachers, allow ourselves to work as though these barriers were real?